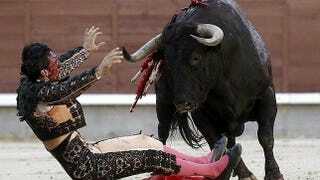 This is the moment Fernando Cruz took a horn halfway through his abdomen, at a Madrid bull ring on Wednesday. Cruz received a couple of gores, to his stomach and abdomen, with both horns. If you're not a fan of killing animals for sport, maybe you're applauding this news. We're not about to call you evil for it. Cruz is in stable condition, with no deadline set for his recovery. The bull? He's dead. All the bulls are dead.